Will Sweden Supply India’s Latest Fighter Jet? Swedish aircraft maker Saab has offered to set up a production line in India to co-produce up to 250 new fighter jets. Swedish aircraft maker Saab and U.S. defense contractor Lockheed Martin are the runner-ups in a fierce international competition to supply the Indian Air Force (IAF) with up to 250 new Western-made single-engine fighter jets in the 2020s. Following a Request for Information (RFI) by the Indian Ministry of Defense (MOD) in October 2016 to global aircraft manufacturers, Saab and Lockheed Martin have pitched the Gripen-E and F-16 Block 70 fighter jet respectively to the Indian government over the last couple of months. Lockheed Martin has proposed to move its F-16 production line to India in accordance with Indian Prime Minister Narendra Modi’s “Build in India” initiative. Saab recently followed suit and pledged to set up its own aircraft production facility in India should the Gripen-E aircraft be selected. 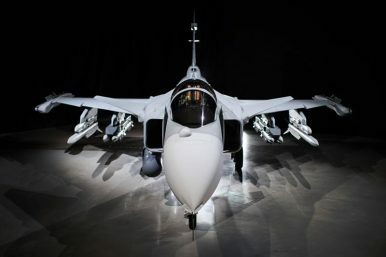 The Gripen-E, an advanced version of the Gripen C/D, is a light single-engine multirole fighter aircraft fitted with advanced avionics including an Active Electronically Scanned Array (AESA) radar, infrared search and track, a new electronic warfare suite, and integrated datalink technology among other things. The Gripen-E and F-16 failed to make the shortlist for the now-scrapped $20 billion MMRCA (medium multi-role combat aircraft) project by French aircraft maker Dassault Aviation in 2011. Both fighter jets were judged too small by the MoD for the medium-weight category. However, India is now looking for a lighter fighter aircraft. As The Diplomat noted previously, should India select Saab as the IAF’s new aircraft supplier it would be the largest arms export deal for Sweden since the 30 Years War. So far, India has not issued a Request for Proposal (RFP), which outlines specific requirements including detailed technology transfer plans. Technology transfers could potentially be an obstacle for SAAB given that the Gripen-E’s engine contains U.S.-made parts. However, the issue was recently dismissed by a senior Saab representative, according to Indian media reports. Saab has also been involved in talks with Indian state-run aircraft maker Hindustan Aeronautics Limited (HAL) to collaborate on the upgraded version of the indigenously developed Tejas Light Combat Aircraft (LCA), dubbed the Tejas Mark-IA. The IAF intends to induct 123 Tejas LCA in two variants in the years ahead. Saab is also slated to pitch a naval version of the Gripen-E to the Indian Navy. As I reported elsewhere, the Indian Navy has officially issued a request for information (RFI) for a new carrier-based multirole warplane in January (See: “India Seeks 57 New Naval Fighter Jets for Carriers”). The IAF currently operates 33 fighter squadrons and wants to increase that number to 42 by 2027. This would require at least six additional squadrons of medium multi-role combat aircraft.